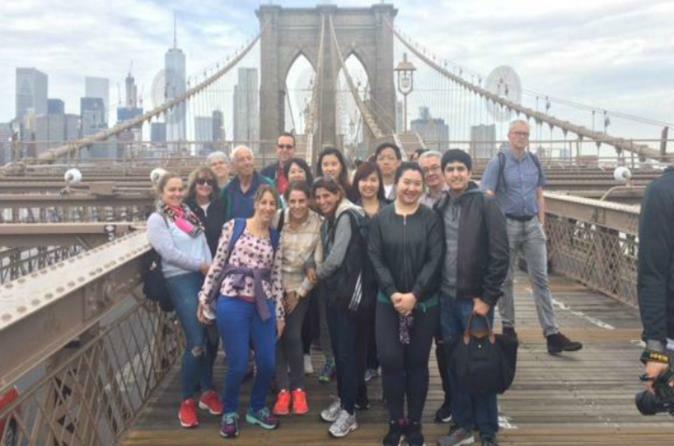 Walk across the Brooklyn Bridge, then explore Brooklyn Heights, DUMBO, Lower Manhattan, and the 9/11 Memorial on a 5.5-hour guided walking tour with an optional upgrade to include the One World Trade Center Observatory. This small-group experience is the perfect way to enjoy New York’s unique neighborhoods while taking in must-see sights and landmarks along the way. This tour begins at City Hall Park, where you’ll meet a guide and small group, then listen to stories about Brooklyn Bridge history as you make your way to the base of the 5,989-foot (1,825-mt.) span. Keep your camera out for the walk across the bridge, which frames views of the Manhattan skyline and the New York Harbor. Spot a few of Brooklyn Height’s classic brownstone-style homes, then visit DUMBO, a creative hub that filled with art galleries and trendy boutiques. Take a 45-minute break for lunch before boarding a ferry to Manhattan (lunch and ferry tickets own expense). Visit Trinity Church, where Alexander Hamilton is buried alongside other New York figures, and stop by historic St. Paul’s Chapel. Walk to the site of the 9/11 Memorial, where you'll learn about the aftermath of the September 11th, 2001 attacks on the Twin Towers. Your walking tour concludes at the base of the One World Trade Center, the tallest building in the Western Hemisphere. At the time of booking, you may add on tickets to the One World Trade Center observation deck, which has panoramic views of the city from floors 100–102, with historic exhibits and displays.